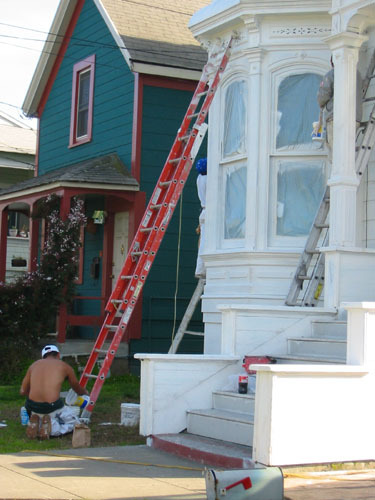 The painters were back today, continuing their work spackling the heck out of the house. I've never seen so much crack filler. It's as if they're adding a skim coat of the stuff to the house. They'll spackle all over the place, then sand the hard edges off. There's also some spot-priming to be done, then they can get started on the colour. In other news, the flood waters beneath the house have retreated from the concrete floor back into the sump hole.